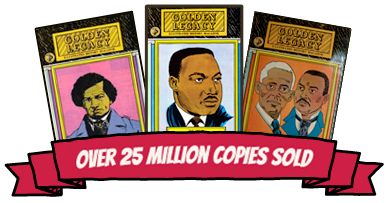 The Golden Legacy Illustrated History Series is truly an Inspirational Series that has motivated many youngsters to accomplish their dreams and become role models themselves!!! Darryl E. Roberts, a 23 year old young man from Brooklyn, N.Y. was inspired by our title on Matthew Henson and his historic expedition with Commander Peary to the North Pole! As a result, Darryl Roberts was motivated to join an international delegation, ICEWALK that was timed to commemorate and celebrate the 80th anniversary of that historic landmark in polar exploration!!! ICEWALK, the first truly international expedition to the North Pole, embarked in December Of 1988 from the northernmost point of Canada, Cape Columbia, on a 65 day, 489 mile trek on foot to the North Pole to carry out scientific studies to determine levels of various pollutants in the Artic atmosphere!!! Words can not express the appreciation I feel for the efforts and struggles you’ve made to continue to publish your Golden Legacy. I’ll never forget that you’ve helped me to see in ‘color’.